One of the best trips to England that can be made is a complete circuit where you will discover the secrets and treasures of this majestic nation. From London to Liverpool, from Oxford to Cambridge, England is a country with whom you can fall in love at first sight. Do not hesitate to travel to England to enjoy a unique country that is full of history, culture and, above all, beauty. For those of you looking to travel to the UK sometime down the road, be it for pleasure or business, make sure to visit these breathtaking places therein. The UK which is called a hub of academic writing help is home to some of the finest sightseeing locales and we have compiled a list for traveling to England. Undoubtedly, one of the most striking things about this English city is the great cultural mix it has. By visiting it you will meet people from many countries and you will enrich yourself considerably. It is worth mentioning that this feature of the city is one of the main reasons why today it is one of the most desired destinations for travelers from all over the world. The city of London is known for having numerous street markets far and wide and distributed on different days of the week. Any day you will have one to go to and from which to return with interesting memorabilia such as the taste of a delicious dessert or artisanal food. The amount of museums that you can visit in London is impressive. In fact, from now on we tell you that you will not be able to know them all. For this reason, going with a clear idea of ​​what you want to see in the city can be essential to make the most of your trip. In addition, the national museums of the United Kingdom are totally free. If you like to go shopping while you travel England, London will fascinate you for its incredible variety. Walk in London to find exclusive stores of brands such as D'ior, Nike, Apple and many others as well as fabulous shopping centers where you can lose yourself without realizing it. If you decide to visit London or any other English city in winter, you should know that you are going to find, most likely, rain and even snow, although this last meteorological phenomenon is less frequent. On the other hand, if you travel in December you can enjoy the joy of the British capital during Christmas in London. You rarely see snow in London. Only for one or two days it snows all winter. If you are reading this article looking for some reason to travel to London in winter, the whole city becomes an attraction in itself. In addition to the thousands of things to do in London, many of them related to the holidays, a foggy London becomes even more charming. Whether for Christmas lights or the smell of mulled wine that invades the streets, is well worth visiting London in winter. Another seasonal drink is Winter Pimms. One of the most interesting activities if you visit London in winter is ice skating. Clearly, you cannot compare the Christmas markets in London with traditional German Christmas markets. London Christmas fairs each year are bigger and better. The best known is Winter Wonderland in Hyde Park and the Southbank Center Christmas Market near the London Eye. And we cannot forget the Winterville fair on Clapham Common, its new location south of London. Like the Hyde Park fair, Winterville has several attractions, including a skating rink and an amusement park. The national opera and ballet companies stage their great shows during the winter. In fact, The Nutcracker is a classic at this time of year. This is one of the Christmas shows in London that you should not miss, either at the Royal Opera House by the Royal Ballet or at the London Coliseum theater. The museums in London schedule major exhibitions for winter. As in other museums in London, the entrance is free only to visit the permanent collection at venues such as Tate Modern and the National Gallery. The most famous Christmas lights in London are those of Oxford Street and Regent Street (the two most important shopping streets of the city), but do not leave aside other smaller ones, such as Carnaby Street. Christmas at Kew show is held every year at Kew Gardens, the Royal Botanical Garden of West London. There you can enjoy a wonderful installation of colorful lights that transforms the place completely. The luminous art invades the center of London with the Lumiere London festival of lights, an innovative proposal that invites Londoners and visitors to discover the city with a new light during a long weekend. However, there is no doubt that one of the main activities of winter in London are the winter sales, which start the so-called Boxing Day. Boxing Day is for England, like the Black Friday is for the United States. The most suitable clothing if you are traveling to London in winter is warm clothing including scarf, fine sweater, cardigan, hat, waterproof shoes, rainwear and thermal underwear. Even some travel agencies organize offers to travel to London at this time. Hoxton and Shoreditch can be said to be just one and, although the younger ones have migrated to cheaper areas such as Dalston or Hackney Wick, Shoreditch is still the mother of all modernity. Strolling along Brick Lane and Shoreditch is a journey through urban art - with works, among others, by Banksy - that has given a new life of color to the brick walls that abound in the neighborhood. Many well-known chains have hotels near Shoreditch for medium budgets. Finally, crossing Shoreditch High Street towards Calvert Ave you reach Boundary Gardens and Arnold Circus, a small circular public garden, our final destination. Brick Lane is the heart of the Bangladeshi community of London, and the curry and signs in Bengali coexist with the new modern premises, the graffiti, the vintage shops, the markets and the iconic tower of the Old Truman Brewery, which It was the largest brewery in London, now a cultural and leisure center. The chalk-like stacks, each of distinct nature rise out of the sea. They are mainly located on the west side of the island. The name is a reference to the fourth needle-like formation which existed in the past but then was destroyed due to a storm in 1764. This is a natural limestone arch and is spread over a beach that makes it a must see the place. Don’t go on its name, it is a beautiful spot but yes to some the name may come off as a bit ancient like it’s from 1000 years ago. The name Cheddar comes from the cheddar cheese for those of you wondering. This is an insanely beautiful place. It has a drop of 137m and is home to the Britain’s oldest skeleton to have ever been found (which if it interests you). England has many beautiful landscapes and one of the most picturesque is the one that decorates the green fields and the golden beaches of Devon. Summer is perhaps one of the best times to cross the English Channel and visit the United Kingdom, and without doubt as soon as the sun shines and the temperature rises a little Devonshire will begin to shine. To plan a good British summer, we propose a trip to Devon County. 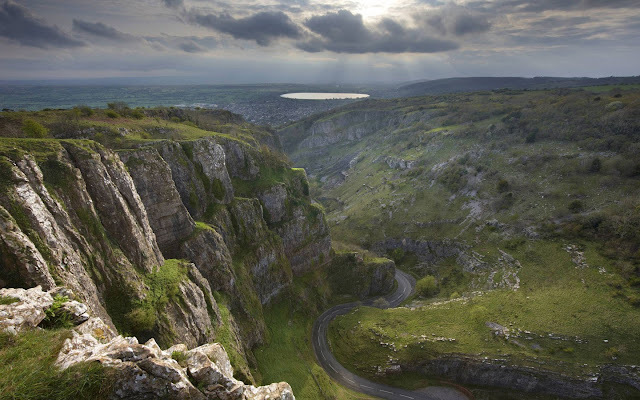 It is in the south-west of England, surrounded by beautiful destinations such as Dorset, Somerset and Cornwall. These English lands were occupied by the Celtic Dumnonii tribes from the Iron Age. Green fields and extensive beaches decorated with cliffs have become over the centuries in ports, villages and spas. North Devon is very varied but is usually the most chosen when it comes to spending time with friends or family. It has sandy beaches with natural pools, in many you can swim or surf and also, inland, there are green valleys. South Devon offers a beautiful coastline and a beautiful internal landscape with ancient villages. Take a tour of Sidmouth, Torquay (here is a fantastic cave full of labyrinths), Totnes or Exeter with its great Gothic cathedral and its two thousand years of history. There are free tours of the old town and its underground passages, an old castle, shopping streets and a canal for canoeing. Plymouth is your destination if you like everything nautical because it is one of the most beautiful natural harbors in the whole world. Do not miss the Smeaton Tower, the history of Francis Drake, the Gin Distillery or the National Aquarium. On the other hand, if you like nature more then the destination is Dartmoor and for coastal landscapes that take your breath away is Exmoor. Compton Castle is in the south of Devon and is an old fortified house of the fourteenth century. A survivor of medieval England. Babbacombe Cliff Railway comes and goes from Oddicombe beach. Branscombe Beach is part of the famous Jurassic Coast, World Heritage, east of Devon, in Seaton. Nearby is the Shingle, with natural rock pools and many trails. Start Point Lighthouse is a 150-year-old historic lighthouse on the south coast of Devon. Castillo Drogo is one of the youngest castles and around it there are other historical attractions such as Powderham Castle or Buckfast Abbey. The climate in Devon is unpredictable so one minute the sun shines and the next one clouds and some drops fall. Do you already want to travel. Devon is accessible by train from many parts of the UK and in fact, the train offers you the most picturesque routes. You can take the Paddington Line or the Waterloo Line and if you prefer the bus as a National Express service. Half an hour, only half an hour is what it takes to leave the continent and find yourself in paradise. Indeed, the Isles of Scilly is one of the most fascinating excursions that can be made in Cornwall, in the southernmost region of England. There are several options to get to Saint Mary's, the largest of the islands, by sea via Penzance, or by plane from the Newquay airport. The landscape that embraces you is a perfect blend of Caribbean island, with its white sand beaches and turquoise blue water, and the typical English taverns (pubs) or seafood restaurants of typically English architecture. While it is true that Saint Mary's is the largest and most visited of the islands, Tresco is the most famous and unique. Its main attraction is the Tresco Abbey Gardens, founded in 1834 on the land that occupied an old Benedictine monastery. It is a 19th-century Gothic castle which was revived. The spot chosen for its construction was on a Welsh hillside and on top of the remains of a 13th-century castle. Cool for some, not for many. Travelers will be able to relate as the place reminds of eastern European forest. The waterfall is some 240ft in height. It falls over in three stages off of the cliff’s face. In order to make the most out of the scenery therein, there is a B&B and also a café should you feel like exploring around. This flamboyant village was meant to look like an Italian hotspot and then turned out to be true with focused planning. You will find it overlooking the Irish Sea. However, the weather is not very friendly. When on a trip by car through England, if you are heading towards Scotland, climbing the east side of the British island, you will have the opportunity to visit the beautiful medieval city of Durham. You will find it almost on the border between England and Scotland, 222 kilometers south of Edinburgh, very close to the city of Newcastle. The medieval city of Durham is characterized and impressed by its spectacular location on the rocky hill that rises over a meander of the River Wear. The central axis of the medieval city is Saddler Street, which you will access through a steep street after crossing the historic Elvet Bridge. Durham Town Hall built in 1850 is going to be the market building that will most arouse our interest. During the Victorian era, an old medieval building was used to build the new Durham Market. Among other points of interest in Durham you will find in the great meadow known as Palace Green, which is the monumental neuralgic center of the city, facing the majestic Durham Cathedral. Durham Castle was declared a World Heritage Site by UNESCO. At present, in the Almshouses we find a café and an art gallery. 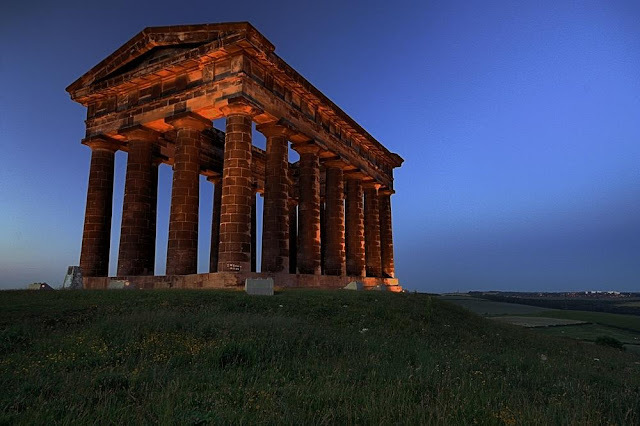 It was built in the year 1884 and was originally intended as the half-size version of the famous Greek monument called The Temple of Hephaestus. By 2011, guests could climb the staircase to the top which is spiral in nature. Edinburgh is a very tourist city, so it will not be difficult to find accommodation for all budgets from B&B and pensions to luxury hotels or hostels with shared rooms. The offer is very extensive throughout the year, although, if you travel in August to visit the Edinburgh Festival or Christmas. For history buffs, walking through the medieval Old Town or exploring the Royal Mile will be an unforgettable journey through time. And those who seek, in addition, to relax and have fun, in bars and pubs with live music find the best place to end the day. Edinburgh Castle, situated on the top of a volcanic rock known as Castle Rock, in the heart of the English city, is one of the most visited places in Scotland. It was, over time, a royal residence, fortress and prison. The Royal Mile is the backbone of the Old City. Flanked by the homes of the Scottish nobles, it extends from the esplanade of the Castle to the Holyroodhouse Palace. On this street also stands St. Giles, the Edinburgh cathedral, built in the fifteenth century and the only medieval church in the city. Old Edinburgh is a city of secrets, mysteries and ghosts. After touring every corner of Edinburgh, you can spend a few days exploring Dublin, capital of Ireland, the city founded by the Vikings that went through a stormy past to enjoy a modern and vibrant present. As for the best areas to stay in Edinburgh, if your priority is to sleep in the center, start looking for accommodation in Old Town and New Town, the two most important neighborhoods of the city. In addition to the Old Town and the New Town, there are other neighborhoods a little further away , such as Leith, Fountainbridge or Newington, which are very well connected to the center by bus and also offer a good selection of accommodation. In the supermarkets of Scotland, like Tesco or Sainsbury's, they sell many meals prepared for a few pounds. Lothian Buses buses cover the entire city and surroundings. Is it possible to travel to Edinburgh in winter? Yes, it is possible and, with a good coat, it is not so much! In fact, more than the temperatures, what can pose a challenge for tourism at that time are the few hours of light. Glasgow Cathedral and its necropolis is the most liked of the city while visiting Scotland. As for the necropolis, it is located next to it, on a hill overlooking Glasgow. It is characterized by being a Victorian cemetery where some 3,500 funerary monuments still stand. George Square is the main square of Glasgow, where the Town Hall is located. The Street art is becoming fashionable in many European cities and Glasgow is no exception. There is a quite impressive urban art route. The Mackintosh lighthouse was built by a young architect as the warehouse of a printing press. One of the main characteristics of the tower is that it contained about 14,000 liters of water in case of fire and that it has a spectacular central spiral staircase. In the 1980s the building was renovated inside to house the Scottish architectural museum. Head to Beinn Dorain, a mountain easily recognizable and admired by all the travelers who cross the Highlands in the direction of Fort William. It is one of the most familiar summits of this area since it has a interesting pyramid shape covered with grass. From Bridge of Orchy you can easily access the hill that later leads to its summit. People who are used to hiking regularly on the mountain or take part in sports and healthy living in general, should not have problems. 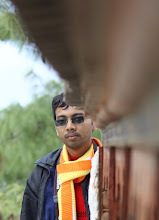 For this type of routes it is essential to use trekking boots, sturdy and with ankle support. 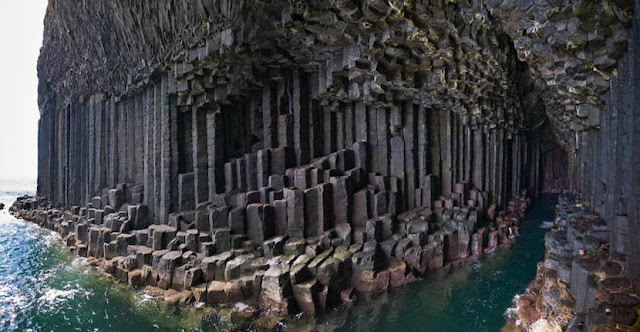 The place is made of hexagon shape pillars and is situated on the uninhabited island of Staffa in Scotland. Yup, you guessed it right, this calls for a boat ride. The Isle of Skye, located next to the west coast of Scotland, is the largest of the islands that make up the Inner Hebrides. It is known for its extraordinary natural beauty and fascinating history steeped in Gaelic culture. Its history, its legends, its landscapes, its music and its poetry make this island, without doubt, a magical place. Loch Coruisk, located in the very heart of the Cuillin Mountains, is without a doubt the most spectacular and remote of all the Scottish lakes. Accessible only by boat or on foot, this lake is surrounded by some of the most impressive mountains in the country. This magical corner is wrapped in ancient legends according to one of which a Kelpie - or water horse in Scottish mythology - inhabits its waters. Explore the northern part of the island known as Quiraing, one of the most spectacular geological areas of Skye. This enchanted landscape with its incredible views, its atmospheric corners and its strange rock formations, has the appearance of a natural surrealist Gothic cathedral. Glencoe, considered one of the most spectacular valleys of the Highlands, is an evocative place for many reasons. Impressive peaks rise into the sky in interesting geological formations fascinating the traveler with its formidable presence. Its countless mountains, whose enormous rocky walls hide mysterious valleys, will delight any hiker. Hiking in Scotland involves towering mountains to conquer and hundreds of trails on the coast, forests and the city to explore. This remote hanging valley, nestled between the impressive peaks of Glencoe, is famous for having served as a hiding place for cattle thieves and their stolen cattle during the time when this place was dominated by the MacDonald clan of Glencoe. Explore Ben Nevis, the highest mountain in the United Kingdom. Climb the so-called tourist route to the Lochan Meall An t-Suidhe lagoon. In the Kintail mountains is the dramatic Glen Shiel valley, surrounded by majestic peaks. In the southern part of this valley explore one of its most beautiful mountain ranges, with seven peaks joined by the mountain known as The Saddle, one of the most beautiful ascents of Scotland and whose conquest offers fantastic views of this wonderful region. To the north of Scotland is the region called Highlands, the Highlands of the Celts, where many of the legends and mysteries of Scotland, such as Loch Ness. We got up early to go to Loch Ness with the intention of photographing the first lights of dawn. We approach to the Urquhart Castle, located right on the edge of the lake. We return again to Inverness to take the route to Mount Cairngorm. We stop for breakfast next to Loch Morlich, a place destined for water sports in the mountains. We passed through Glenmore National Park, which turned out to be another Loch Lommond but without lakes. In the heart of the Glenmore Forest Park is the winter resort of Cairgorm, one of the most important centers of winter sports. We climbed up to the facilities, just as the first snowflakes of the day began to fall. We are now looking for the so-called Whiskey Trail and Castle Trail. In this area we find farms dedicated to the breeding of the typical hairy cow and wide cereal growing areas populating the Scottish countryside in Advie. We decided to go north and in Banffshire, we stopped at the entrance to Ballindalloch Castle. In the middle of the afternoon we arrived at Lossiemouth. East Beach is located at the entrance to the village. By looking at it, you will tell yourself that this should be somewhere on a small Indonesian island. But you will be disappointed because it is not. Rather it is situated at the top of the UK. Ever heard of Hermit’s Castle, well, it is located here only which happens to be Europe's tiniest castle. This is a freshwater cave engulfed by spectacular sea and packs a 20m waterfall. You can go for hitchhiking on a boat ride to visit the inner chambers. Doesn't this sound exciting? Great list! I'll save for when I visit! So many beautiful places to be added in the travel list. Well I hope to visit even just some of these amazing European places. UK has been on my list for so long! 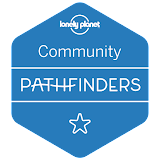 I've been doing some research on where to go but some of these never came up so thank you for sharing these gorgeous sites! 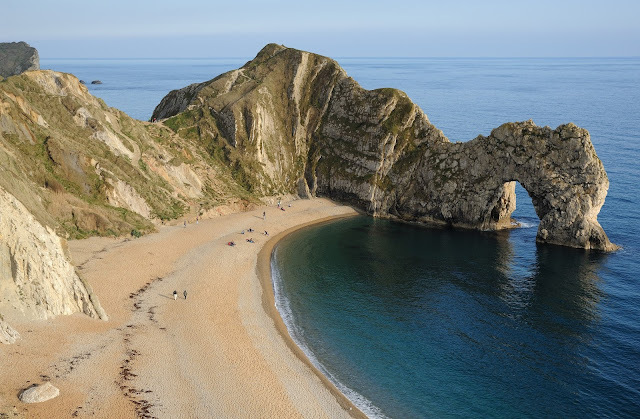 Wow Durdle Door looks epic. A great example here of what travel is all about....you can go to the same place again and again and never feel like you've seen enough. Some incredible places here that I shall remember just in case I get close to them.